Capt. 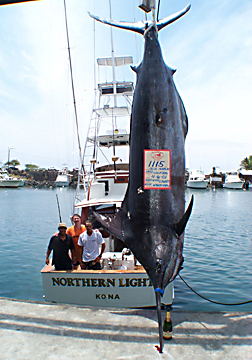 Kevin Nakamaru of the 37-foot Merritt, the NORTHERN LIGHTS, completed his grand slam of 1,000-lb marlin with this fish. He's taken granders from the Atlantic and in Australia. Both were taken on the same lure! This fish ate a Marlin Magic lure on a 130-class outfit.